The Energy Department on February 21 announced that Johnson Controls, Macy's, and Sprint are joining the Better Buildings Challenge. Launched by President Obama in 2011, the Better Buildings Challenge brings together corporations, universities, municipalities, and other national leaders to make significant commitments to energy efficiency to reduce waste and save on energy costs. Johnson Controls, Macy's, and Sprint will collectively upgrade more than 200 million square feet of building space to cut energy use by at least 20% by 2020. These steps support the President's goal of cutting energy waste from homes and businesses in half over the next two decades, which was articulated in the 2013 State of the Union address. The United States spends about $200 billion annually to power commercial buildings and another $200 billion to power industrial facilities. Better Buildings Challenge partners work with the Energy Department to implement energy-savings practices that reduce energy waste and save money. These new partners will also share facility-level energy use data and successful strategies with Better Buildings Challenge partners as well as other U.S. businesses and organizations helping to lead a clean, sustainable energy economy. The Better Buildings Challenge now has more than 110 partners, representing two billion square feet of building space and more than 300 manufacturing facilities. See the Energy Department Progress Alert and the Better Buildings Challenge website. The Energy Department's Advanced Research Projects Agency—Energy (ARPA-E) on February 26 announced that ARPA-E projects have demonstrated major technical successes and shown significant market engagement in the four years since the agency began catalyzing energy breakthrough technologies. Overall, 17 projects have attracted over $450 million in private sector follow-on funding after ARPA-E's initial investment of approximately $70 million, 12 have leveraged their technologies to form new companies, and more than ten have partnered with other government agencies for later stage investment. The innovations include improved batteries, electric vehicle motors, solar thermochemical fuel production, and wind turbines among a range of technologies. Building on President Obama's call in his 2013 State of the Union address to further American energy independence through innovation, key thought leaders from academia, business, and government are coming together this week to discuss cutting-edge energy issues at ARPA-E's fourth annual Energy Innovation Summit in National Harbor, Maryland. See the Energy Department press release. The Energy Department's SunShot Initiative recently announced up to $17 million to support the development of innovative, cost-effective solutions to boost the amount of solar energy that utilities can integrate seamlessly with the national power grid. This funding will help utilities develop adaptable and replicable practices, long-term strategic plans, and technical solutions to sustain reliable operations with large proportions of solar power on the grid. It will also support projects aimed at improving the lifetime and reliability of solar modules and electronics. The funding is being offered through two opportunities. The Solar Utility Networks: Replicable Innovation in Solar Energy (SUNRISE) funding opportunity is making up to $12 million available for projects to enable utilities to develop long-term strategic plans that integrate high levels of renewable energy generation and ensure reliable real-time power system operations under high renewable penetration. Funding is also available for projects to provide technical assistance for capacity-building activities regarding utility-scale photovoltaic (PV) planning and installation. The application deadline for the funding opportunity is April 24, 2013. See the SUNRISE solicitation. The Golden Valley Electric Association developed the 25-megawatt Eva Creek Wind Farm in Ferry, Alaska in 2012. The Energy Department on February 21 recognized the East River Electric Power Cooperative of South Dakota and the Golden Valley Electric Association of Alaska as the 2012 Wind Cooperatives of the Year. East River and Golden Valley were selected by a panel of experts from the wind industry, utilities, government, national laboratories, and cooperatives. East River Electric Power Cooperative of Madison, South Dakota, is a wholesale electric power supply cooperative serving eastern South Dakota and western Minnesota. The cooperative is regarded as one of the earliest champions in installing the first utility-scale wind turbines in the Dakotas. In 2009, the co-op created South Dakota Wind Partners LLC, which is a model for community-based, locally-owned wind development that is fully financed by South Dakota residents. The Golden Valley Electric Association is focused on generating 20% of its peak load electricity—the power supplied when customer demand is highest—from renewable energy by 2014. As part of this commitment, Golden Valley developed the 25-megawatt Eva Creek Wind Farm in Ferry, Alaska, in 2012. The remote site is located at the end of a 10-mile dirt road, contributing to unique construction challenges. The Eva Creek Wind Farm project is expected to help the cooperative meet its renewable goals ahead of schedule, reduce dependence on oil, and save Golden Valley members as much as $4 million in annual electricity costs by the end of 2013. See the Energy Department Progress Alert and the Wind Powering America website. The Electric Power Research Institute (EPRI) recently completed a mapping and assessment of hydrokinetic resources in continental U.S. rivers and found that these undeveloped resources could provide 3% of the nation's annual use of electricity. The assessment is part of an effort by the Energy Department to characterize U.S. hydrokinetic waterpower resources, including river, wave, tidal, ocean thermal, and ocean current. The assessment analyzed 71,398 river segments across the 48 contiguous states and additional river segments in Alaska. It yielded a total theoretical resource estimate of 1,381 terawatt-hours per year (TWh/yr) for the continental United States, which is equivalent to approximately 25% of annual U.S. electricity consumption. Because there are constraints on developing many sites, the study found that the technically recoverable resource estimate for the continental United States is 120 TWh/yr, or approximately 3% of annual U.S. electricity consumption. The results show that the Lower Mississippi region contributes almost half (47.9%) of the technically recoverable resource estimate; Alaska, 17.1%; the Pacific Northwest region, 9.2%; and the Ohio region, 5.7%. See the EPRI press release. Known for chewing gum and candy products, Wrigley Manufacturing Company recently expanded its commitment to sustainability and is collecting solar power to help run its Altoids manufacturing plant in Chattanooga, Tennessee. Using funds from the Energy Department's State Energy Program, the company installed 240 rooftop solar panels (a 50.4-kilowatt array) on its Chattanooga facility in December 2010. The solar panels cover about one-seventh of the plant's roof, leaving plenty of room for expansion. The array generates more than 170,000 kilowatts of clean energy per year—about 3% of the plant's energy use—and eliminates 117 tons of greenhouse gas emissions. During the first year of operation alone, the solar installation saved Wrigley more than $16,000 in electricity costs. The solar installation is a part of Wrigley’s "Sustainable in a Generation" effort to eliminate fossil fuel energy use and greenhouse gas emissions by 2040. Wrigley is developing a strategy to minimize its impact on the environment, focusing on reducing fossil fuel energy use, greenhouse gas emissions, and waste. From 2007 to 2011, Wrigley's landfill waste decreased by 71.62%, greenhouse gas emissions by 2.37%, and energy use by 7.75%. See the Energy Blog. Tvrtka Ara-solar d.o.o. na čelu sa mr. sc. Damirom Vragovićem koja ima zastupništvo tvrtke TRITEC za jugoistočnu Europu uspješno plovi nemirnim morem obnovljivih izvora energije u Republici Hrvatskoj. Tvrtka Ara-solar d.o.o. zastupništvo tvrtke TRITEC održava i praktične radionice i predavanja za obrtnike zainteresirane za poslove instalacije fotonaponskih sustava. Radi se o grupama od četrdesetak polaznika radionica, od kojih neki već imaju iskustva u radu s fotonaponskim sustavima, a neki se s tom tehnologijom tek susreću.Na radionicama obrtnici i majstori vježbaju na montažnim konstrukcijama TRI Stand Aero, koji su namijenjeni za ravne krovove. Tijekom praktične obuke polaznici imaju priliku upoznati softver TRI dizajn koji je među rijetkim softverskim rješenjima na hrvatskom jeziku i služi za dimenzioniranje fotonaponskih sustava. Također rade na montažnim sustavima i u softveru za dimenzioniranje TRI dizajna na hrvatskom jeziku, a dobivaju i znanja i informacije o najnovijim tehničkim dostignućima Bosch modula. Teoretski dio nastave, uz djelatnike tvrtke Ara-solar, održavaju i predavači tvrtke Bosch Solar iz Njemačke, koji prezentiraju njihove najnovije visokoučinkovite fotonaponske module. Polaznici na radionicama dobivaju i certifikat kojim se produžuje garancija na proizvod TRI Stand Aero s pet na deset godina. Ara-solar konstrukcije za montažu sustava omogućuju jednostavno i brzo montiranje fotonaponskih modula na sve vrste krovova pa čak i na pročelja zgrada. Sve komponente montažnog sustava su testirane tako da posjeduju sve potrebne certifikate i dozvole za korištenje od proizvođača modula. U ponudi su i solarni rasvjetni stupovi idealni za stambene površine, javne trgove, ulaze zgrada, pješačke i biciklističke staze, mostove, parkove, vrtove, igrališta i kampove, vodena pročelja, autobusne stanice, sport i rekreaciju. Praćenje rada sustava se prakticira kako bi se povećala količina energije koja se dobiva iz fotonaponskog sustava te kako bi se otklonile eventualne greške ili kvarove. Za tu svrhu Ara-solar nudi veliki izbor mjernih instrumenata, kablova, pribora i pripadajućeg alata. Velika nam je čast i zadovoljstvo bilo predstaviti Vam tvrtku Ara-solar d.o.o. Sigurnost i pouzdanost, povoljne cijene i kvaliteta usluge, iskustvo i poslovna strategija u osmišljavanju i realizaciji brojnih solarnih sustava glavne su prednosti tvrtke Ara-solar d.o.o. President Obama highlighted clean energy during his State of the Union address on February 12, 2013. President Obama on February 12 highlighted clean energy and challenged the nation to become even more energy efficient during his State of the Union address to Congress. During the speech marking the start of his second term of office, President Obama spoke about a range of clean energy topics, including cars and transportation, energy efficiency, manufacturing, and wind and solar energy. He called for continued national investment into research, saying "now is the time to reach a level of research and development not seen since the height of the Space Race. And today, no area holds more promise than our investments in American energy." He added, "We are finally poised to control our own energy future." President Obama cited recent advances in wind and solar energy over the past four years, a period which began as "other countries dominated the clean energy market and the jobs that came with it." 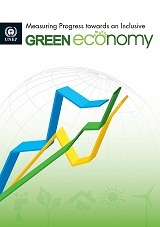 He noted that conditions in the clean energy market are improving in the United States. "Last year, wind energy added nearly half of all new power capacity in America. So let's generate even more. Solar energy gets cheaper by the year—so let's drive costs down even further." President Obama also heralded new manufacturing efforts by announcing the launch of three more manufacturing hubs where businesses will partner with the Departments of Energy and Defense "to turn regions left behind by globalization into global centers of high-tech jobs." He said he is asking Congress to help create a network of 15 of these hubs to ensure that the United States remains a leader in manufacturing. As an indicator of progress, President Obama affirmed that now "we buy more American cars than we have in five years, and less foreign oil than we have in 20." Furthermore, he noted that those cars are more fuel efficient. "We have doubled the distance our cars will go on a gallon of gas," he said. As he cited the benefits of reduced dependence on foreign oil, particularly the decline in carbon pollution as result of increased renewable energy usage, he challenged the nation to become even more energy efficient. "I'm also issuing a new goal for America: let's cut in half the energy wasted by our homes and businesses over the next 20 years." See the full text of the State of the Union address on the White House website. The Energy Department on February 14 announced a $1 million investment to analyze potential cost-competitive pathways for producing and transporting hydrogen fuel. The project selected will identify cost-effective and efficient materials and processes to produce hydrogen from renewable energy sources. This investment supports the Energy Department's broader goal to lower the cost of hydrogen fuel to $2-$4 per gallon gasoline equivalent (gge) by 2020 to make hydrogen fuel cost-competitive with gasoline. The project, led by Strategic Analysis in Arlington, Virginia, will help accelerate commercialization of cost-competitive, U.S.-made hydrogen and fuel cell technologies. The project will conduct thorough cost analyses of hydrogen pathways to identify the most economical hydrogen production and delivery methods and highlight remaining research and development challenges. 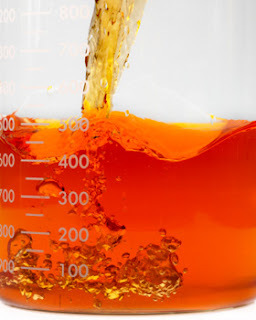 With the help of this Energy Department investment, Strategic Analysis will examine a range of hydrogen production pathways, including electrolysis from the electrical grid and renewable energy sources, converting biofuels to hydrogen, biomass gasification, solar thermochemical hydrogen, photoelectrochemical hydrogen, and biological hydrogen. See the Energy Department Progress Alert. The U.S. Department of Energy (DOE) on February 14 announced the winners of the fifth annual Next Generation Luminaires™ Design Competition for outdoor lighting. The competition was launched in 2008 to promote excellence in the design of energy-efficient commercial lighting fixtures, or "luminaires," that employ light-emitting diodes (LEDs). The "best-in-class" winners for four categories of outdoor lighting include The Lighting Quotient of West Haven, Connecticut, for its façade-lighting fixture, the fraqti™ Outdoor-Style S170 luminaire; Relume Technologies of Oxford, Michigan, for its Oxford decorative acorn fixture for streetscapes and walkways; GE Lighting of East Cleveland, Ohio, for its roadway lighting fixture, the Evolve™ LED Scalable Cobrahead luminaire; and Edge Lighting of Chicago, Illinois, for its decorative wall sconces, the "TV" and "Dial" LED luminaires. The competition was sponsored by the Energy Department, the Illuminating Engineering Society of North America, and the International Association of Lighting Designers. A panel of eight judges from the architectural lighting design community evaluated 120 outdoor lighting entries from 42 manufacturers based on lighting quality, appearance, construction, serviceability, efficacy, and value. 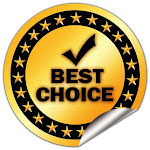 In addition to the four "best-in-class" winners, 33 entries were judged as meeting the stringent requirements of the competition. These recognized winners represented a wide range of manufacturers and applications, including lighting for roadways, streetscapes, walkways, parking lots, parking garages, canopies, façades, and landscapes, as well as decorative lighting and wall-mounted area lighting. Design competitions are a key part of the Energy Department's national strategy to accelerate solid-state lighting technology advances from laboratory to marketplace. Solid-state lighting, which includes both LED and organic light-emitting diode (OLED) technologies, has the potential to save Americans $30 billion per year in energy costs by 2030. See the Energy Department Progress Alert and Solid-State Lighting website, and see the Next Generation Luminaires website for photos and details about all the winners of this year's competition. The latest U.S. Environmental Protection Agency (EPA) Green Power Partnership’s Top Partner Rankings show that two more companies have now purchased enough green power to account for 100% of each of their total U.S. electricity use. Since the EPA's last quarterly Green Power Partnership update in October 2012, Intel expanded its use of green power from 88% to 100% of its total electricity use by purchasing 300 million kilowatt-hours (kWh) of green power, while Staples increased from 80% to 101% green power use by adding 120 million kWh of green power. Intel and Staples join 15 other Top 50-ranked Green Power Partners in obtaining 100% or more of their electricity from renewable energy sources. The recently-released totals are up to date as of January 9, 2013. Intel, which currently ranks first in the total amount of purchases on the Green Power Partnership Top 50 list, uses electricity generated from biogas, biomass, small hydro, solar, and wind. Staples, ranked sixth overall on the Top 50 list, sources its electricity from biogas, solar, and wind energy. 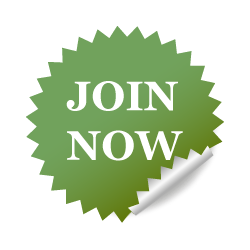 The Green Power Partnership works with a variety of organizations including major companies, colleges and universities, as well as local, state, and federal governmental agencies to promote the use of green power. Organizations can meet EPA Green Power Partnership requirements using any combination of three different product options: renewable energy certificates; on-site generation; and utility green power products. Combined, the top 50 largest purchases of green power by EPA Green Power Partners amount to more than 17 billion kWh annually, which represents nearly 70% of the green power commitments made by all EPA Green Power Partners. Usage amounts in the rankings reflect U.S. operations only and are sourced from U.S.-based green power resources. See the EPA Green Power Partnership Top 50 webpage and DOE's Green Power Network website. What's Your PEV Readiness Score? Removing early market barriers is essential to increasing the number of plug-in electric vehicles (PEVs) on the road. To help cities, counties and states cut red tape, save time and improve drivers’ experiences, the Energy Department's Clean Cities initiative created the Plug-in Electric Vehicle Readiness Scorecard. The Scorecard is an interactive online tool that allows community managers to measure their regions' current "PEV-friendliness"—the ability to meet the needs of electric vehicle drivers. To calculate their scores, community representatives answer a series of multiple-choice questions covering diverse topics ranging from the time required to issue a residential charger permit to incentives available to PEV drivers. The Scorecard questions, which are based on best practices and input from key stakeholders, require real, on-the-ground data from the community. Because PEV community readiness often involves a number of city agencies, non-governmental organizations, and even local businesses, multiple users can enter information for the same region on one account. For the complete story, see the Energy Blog. EU Sustainable Energy Week (EUSEW) is an initiative of the European Commission that first took place in 2006 with hundreds of organisations and individuals participating each year. The next edition of the European Union Sustainable Energy Week (EUSEW) will take place from 24 to 28 June 2013. THIRD GENERATION BIOFUELS FROM ALGAE Croatian Center of Renewable Energy Sources (CCRES) have a new technology with major potential to contribute to the fight against climate change.As with all new technologies, careful consideration of potential impacts on the environment and human health is important. The international community has acknowledges that global warming needs to be kept below 2˙C (3,6˙F) compared with the pre industrial temperature in order to prevent dangerous climate change.This will require significant reductions in the world´s emissions of CO2 and other greenhouse gases (GHG) over the coming decades.CCRES have one of the technologies that can help to achieve this. The EU, which is responsible for around 11% of global GHG emissions today, has put in place binding legislation to reduce its emissions to 20% below 1990 levels by 2020.Europe is also offering to scale up this reduction to 30% if other major economies in the developed and developing world´s agree to undertake their fair share of a global reduction effort. This is why the EU must support alternative fuels, in particular biofuels, with the triple objective of reducing greenhouse gas emissions, diversifying fuel supply and developing longterm replacements for fossil fuels. Third generation biofuels from algae will have an important role to play as soon as they are ready for the market. 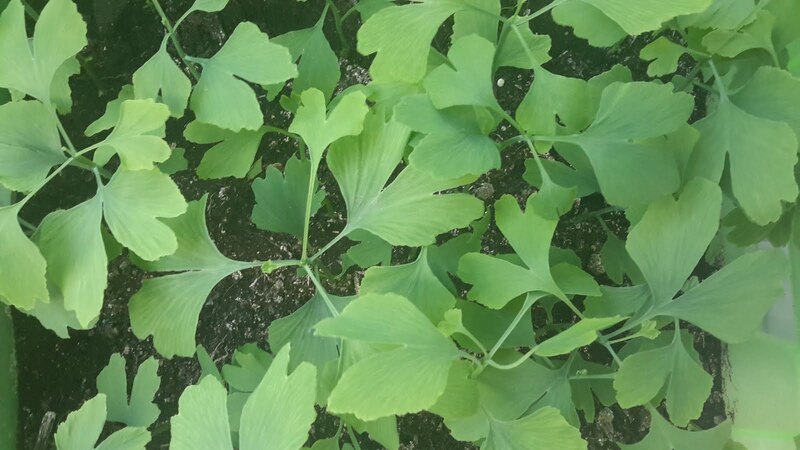 They should be more sustainable, boasting both a lower enviromental impact and lower costs.Biofuels must become a commercial and competitive product using the broadest range possible of raw materials from both Nord and South Europe. Biofuels from algae have a big role to reduce CO2 emmisions. The sustainability of algae biofuels and their potential impacts on other sectors, including land use, are will remain critical issues.Algae biofuels provide an important contribution towards climate change mitigation and security of supply.They are only part of the solution, and must be considered in a wider context, in which efforts are also being made to reduce transport demand, improve transport efficiency and encourage the use of environmentally friendly modes of transport. Environmental Sustainability: Moving From the MDGs to Post-2015 is the topic for the UN's current e-Discssion. 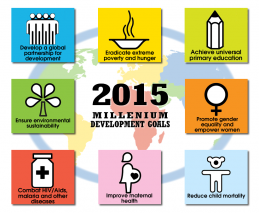 It aims to look broadly at what we have learned from the MDGs and explore how to frame the next set of goals. For more information, see the 90 discussion notes and Framing Paper with background on the questions being asked. The discussion runs from 4 February to 1 March 2013 with weekly themes. 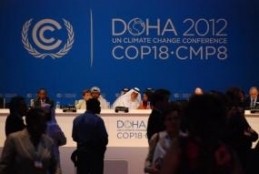 The UN Climate Change Conference in Doha ended on 8 December 2012 with a number of important agreements reached. The conference confirmed a UNEP-led consortium as host of the Climate Technology Center (CTC), for an initial term of five years. 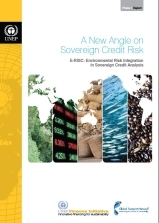 The CTC, along with its associated Network, is the implementing arm of the UNFCCC's Technology Mechanism. 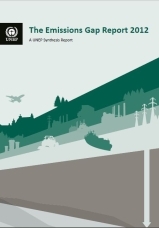 For more information on the conclusions of the conference, click here, or see UNEP's third annual ‘Emissions Gap Report’ released before the conference. 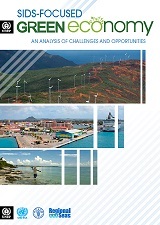 The possibilities for green economy policies for small island developing states. Read the full report. 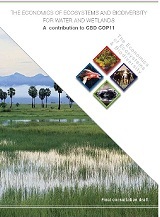 Expansion and Conservation Priorities in Tropical Countries is a report that shows that an increase in the amount of land being used for crops is one of the main reasons for the continuing loss of biodiversity and threatens to undermine attempts to meet international environmental goals. Click to learn more or for the full report. 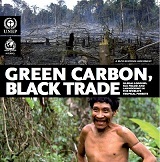 The process of illegal logging carried out largely by organized crime is threatening efforts to combat climate change, deforestation, conserve wildlife and eradicate poverty and is hampering the efforts of REDD. Learn more or view the full report. 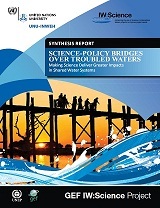 A study of over 200 major water-related projects, this report concludes that disjointed management of human demands on water and aquatic systems has now put social and ecological systems in jeopardy. Learn more and read the report. 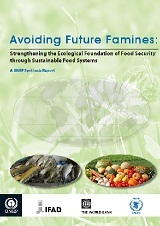 This report addresses the ecological foundation of food security. The report argues that while factors such as availability, access, utilization and stability must be given adequate attention, the ecological dimension is not only being overlooked but undermined. Learn more or get the full report. 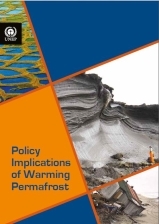 Highlights the potential hazards of carbon dioxide and methane emissions from warming permafrost. Learn more or read the full report. 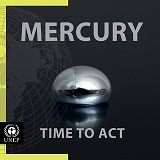 UNEP's report outlining the dangers caused by current levels of mercury exposure, which was released ahead of the successful negotiations to create a binding commitment on the part of 140 nations to cut mercury emissions. 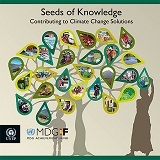 This booklet presents 24 case studies from 17 countries on grassroots solutions to the impacts of climate change. 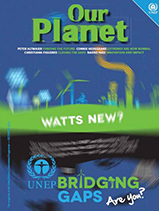 Have a look at the latest issue of UNEP's magazine featuring an article by European Climate Commissioner Connie Hedegaard. 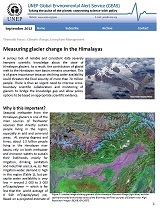 This bulletin highlights the need for more reliable and consistent data about the state of Himalayan glaciers. Learn more. 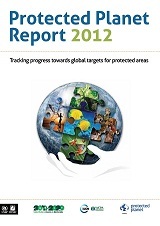 The third edition of UNEP's Emmissions Gap report launched on the eve of climate change negotiations in Doha. Learn more or read the full report. The key role that wetlands play in supporting human life and biodiversity needs to be recognized and integrated into decision-making as part of the transition to a resource-efficient, sustainable world economy. Learn more or read the full report. 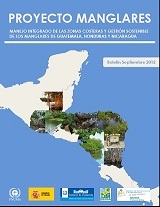 Newsletter with updates on the sustainable management of mangrove plantations in Central America. In Spanish. This report shows that despite the growing number of nature reserves, national parks and other protected areas across the globe, half of the world's richest biodiversity zones remain entirely unprotected. Read more or view the full report. Analysis of the unprecedented imapcts of climate change on Island communities in the Pacific Ocean. Learn more or read the full report. 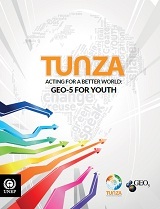 TUNZA: Acting for a Better World is a report produced by and for youth, which builds on UNEP's GEO 5 report and examines whether environmental targets are being met, and what is being done by young people to try and make sure they will be. Full report. The Energy Department announced on January 31 that 13 major U.S. employers and eight stakeholder groups have joined the new Workplace Charging Challenge to help expand access to workplace charging stations across the country. The Workplace Charging Challenge is a collaborative effort to increase the number of U.S. employers offering workplace charging by tenfold in the next five years. The first 13 employers have signed the Workplace Charging Pledge as partners, including 3M, the Chrysler Group, Duke Energy, Eli Lilly and Company, the Ford Motor Company, General Electric, General Motors, Google, Nissan, the San Diego Gas & Electric Company, Siemens, Tesla Motors, and Verizon. The pledge commits each partner organization to assess workforce charging demands for plug-in electric vehicles (PEVs) and to develop and implement a plan to install workplace charging infrastructure for at least one major worksite location. Eight stakeholder organizations also have signed the Ambassador Pledge to develop and execute plans to support and promote the workplace charging initiative, including: the California PEV Collaborative, CALSTART, the Electric Drive Transportation Association, the Electrification Coalition, the International Parking Institute, NextEnergy, Plug In America, and the Rocky Mountain Institute. The Energy Department will provide technical assistance and establish a forum for partners and ambassadors to share information. The Workplace Charging Challenge supports the broader efforts of the Department's EV Everywhere Grand Challenge, announced by President Obama in March 2012, to make PEVs as affordable and convenient for American families as gasoline-powered vehicles within the next 10 years. As part of the announcement, the Department released the EV Everywhere Grand Challenge Blueprint, which describes PEV technology and deployment barriers, as well as steps to move forward in achieving the EV Everywhere goal. See the Energy Department press release and the EV Everywhere Grand Challenge Blueprint and webpage. The Energy Department announced on January 30 its selection of seven data-driven projects to unearth new opportunities for reducing solar energy costs and accelerating solar energy deployment in the United States. The Department will invest about $9 million in the seven projects, located in six states: California, Colorado, Connecticut, Massachusetts, North Carolina, and Texas. The projects are part of the SunShot Initiative, a collaborative national effort to make solar energy cost-competitive with other forms of energy by the end of the decade. For four of the projects, the Energy Department will provide $7 million to research teams led by Sandia National Laboratories, the National Renewable Energy Laboratory (NREL), Yale University, and the University of Texas – Austin (UT-Austin). These teams will partner with public and private financial institutions, utilities, and state agencies to apply statistical and computational tools to solve industry problems and lead regional pilot projects across the country to test the impact and scalability of their innovations. For example, Yale University researchers will partner with SmartPower's New England Solar Challenge to design and implement innovative strategies that can increase the effectiveness of community-led bulk purchase programs for solar power. The team from the UT-Austin will work with complex datasets from six Texas utilities to better understand customer needs and identify opportunities to streamline installation and interconnection. Similarly, NREL will develop a computational model to analyze data from a network of U.S. solar installers and help identify new types of community- and regional-scale strategies to drive down financing and deployment costs. The Department will also invest $2 million in three projects led by the University of North Carolina – Charlotte (UNC Charlotte), the Massachusetts Institute of Technology (MIT), and SRI International to analyze decades of scientific publications, patents, and cost and production data. SRI International will develop advanced software that reads and analyzes thousands of scientific publications and patents to discover new ways to speed solar energy technology innovation and commercialization. Meanwhile, MIT and UNC Charlotte will apply computational tools to patent, cost, and production data to speed up solar technology cost reductions and better forecast future cost reductions for new energy technologies. See the Energy Department press release and the full list of projects . The U.S. wind energy industry had its strongest year ever in 2012, the American Wind Energy Association (AWEA) announced on January 30. The industry installed a record 13,124 megawatts (MW) of U.S. electric generating capacity last year, achieving over 60,000 MW of cumulative wind capacity, enough to power almost 15 million homes. The annual total far surpasses the previous record of 10,000 MW installed in 2010. For the first time, wind energy became the number one source of new U.S. electric generating capacity, providing 42% of all new generating capacity. In last year's fourth quarter alone, 8,380 MW were installed, making it the strongest quarter in U.S. wind power history. AWEA noted that this was due in large part to impending expiration of the federal Production Tax Credit. It was slated to end on December 31, 2012, but was extended by Congress as part of the American Taxpayer Relief Act of 2012. The top 10 states for new capacity installations in 2012, in order, were Texas (1,826 MW), California (1,656 MW), Kansas (1,440 MW), Oklahoma (1,127 MW), Illinois (823 MW), Iowa (814 MW), Oregon (640 MW), Michigan (611 MW), Pennsylvania (550 MW), and Colorado (496 MW). The Golden State regained its position as the second largest state in installed wind capacity, surpassing Iowa, which had been number two since 2008. California achieved the 5,000-MW milestone in wind capacity, following Texas, and alongside Iowa. See the AWEA press release. The Energy Department on January 28 announced about $6 million for projects that will develop and demonstrate supply-chain technologies to affordably deliver commercial-scale lignocellulosic biomass feedstocks such as woody plant tissue to biorefineries across the country. This funding will help accelerate the development of integrated, cost-effective supply-chain systems that reduce time and costs to produce biofuels for cars, trucks, and airplanes. The Department will make available about $6 million this year for one to two multi-year projects. All selected projects will require a cost share contribution by the grant recipient, including 20% for research and development activities and 50% for demonstration activities. See the Energy Department Progress Alert and the full funding announcement. The Energy Department on January 30 announced the second round of the Strategic Technical Assistance Response Team (START) Program, which provides federally recognized Tribal governments with technical assistance to accelerate clean energy project deployment. Additionally, the Energy Department plans to seek information from tribes interested in launching or expanding utility services in their own communities, which will help establish a new START Utility Program (START-UP). Additional details on this effort will be available on the Office of Indian Energy website in the coming weeks. Over the past year, the START program has helped nine Tribal communities advance their clean energy technology and infrastructure projects, from solar and wind to biofuels and energy efficiency. The second round of technical assistance awards will build upon the initial successes of the START program and further help Native American and Alaska Native communities increase local generation capacity, enhance energy-efficiency measures, and create local entrepreneurial and job opportunities. In the contiguous United States, Energy Department and national laboratory experts will provide technical assistance on tribes' clean energy project development. In Alaska, the Energy Department and the Denali Commission will help rural Alaska Native communities conduct energy awareness and training programs and pursue new renewable energy and energy efficiency opportunities. Applications are due by March 15, 2013. See the Energy Department press release and the Office of Indian Energy Policy and Programs webpage. In a letter to Energy Department employees on February 1, Energy Secretary Steven Chu highlighted the tremendous progress of the last four years and announced his decision to not serve a second term as Secretary. Text of the letter is below. For the rest of Secretary Chu's letter, see the Energy Blog.